An occlusion of the indicated vessel would result in which of the following deficits? 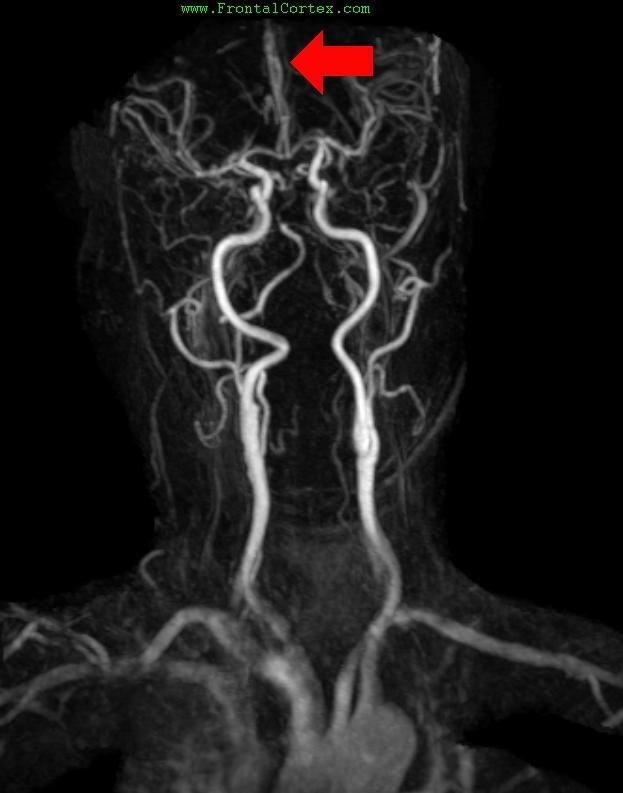 The arrow in this gadolinium bolus MR angiogram indicates the left anterior cerebral artery. An occlusion of this vessel would produce hemiparesis of the lower extremity, sparing the face and upper extremity. Balint syndrome (a constellation including psychic paralysis of gaze, optic ataxia, and visual inattention) is associated with bilateral lesions in the parietal-occipital vascular border zones. Anton syndrome (denial of blindness by a person who obviously cannot see) is associated with lesions in the visual association cortex. This question has a good number of images and permutations programmed into it. Hit the "reload" button a few times, and you'll see what I mean.